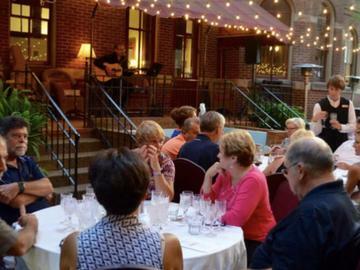 You're invited to join wine host Cory Hart of Winebow and us for a night of live entertainment, wine, great food and camaraderie al fresco in our beautiful courtyard (weather permitting) on Thursday, July 19 from 6:30 - 8:30PM or in our spectacular The Grand Hall at The Priory. You'll enjoy four wines from the Iberian Peninsula which is located on the southwestern part of the continent of Europe – almost like a little tip – and it is where Portugal and Spain are located. And, it is named after an ancient people who the Greeks named “Iberians." Tickets are $60 per person. For reservations or more details, please contact General Manager, Rebecca Lazeration - Rebecca@ThePriory.Com - 412.224.6304.